The International Society for the Advancement of Kinanthropometry held its 8th International Conference in Manchester in July 2002. This volume contains a selection of papers presented to the Conference, where the meeting was held in conjunction with the 12th Commonwealth International Sport Conference, immediately prior to the XVII Commonwealth Games. 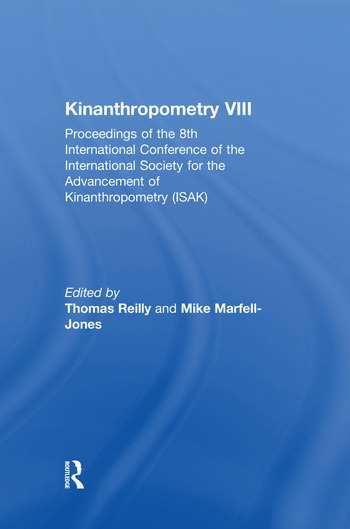 The collection of the chapters into an edited book provides readers with an outline of the current state of knowledge in kinanthropometry. Thomas Reilly is President of the World Commission on Science and Sport and Director of the Research Institute for Sport and Exercise Sciences at Liverpool John Moores University. Mike Marfell-Jones is Chair of Health Sceinces, University College of Learning, Wellington, New Zealand and President, International Society for the Advancement of Kinanthropometry.